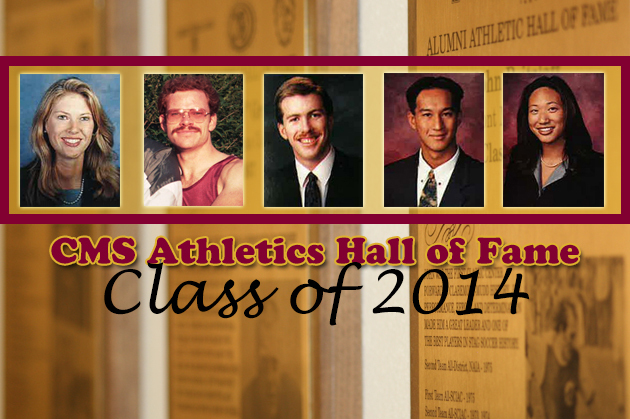 A group of five Claremont-Mudd-Scripps athletic greats have been selected as inductees into the CMS Athletics Hall of Fame Class of 2014, Michael Sutton ’76, Director of Athletics, William B. Arce Professor and George R. Roberts Fellow has announced. The 2014 class includes four Claremont McKenna College graduates (Mike Dawe ’89 – Men’s Basketball; Amy Cleveland ’95 – Women’s Basketball; Quang Leba ’97 – Men’s Track/Water Polo; Margaret Wang Rattay ’97 – Women’s Swimming/Water Polo) and one inductee from Harvey Mudd College (Tony Gnecco ’89 – Men’s Track & Field). Accolades for the Class of 2014 include NCAA qualifiers, All-Americans, SCIAC champions and much more. The five CMS alumni will officially be inducted at the department’s annual Hall of Fame Banquet which is scheduled to be held at the Marian Miner Cook Athenaeum on Claremont McKenna College’s campus on Saturday, Nov. 8. Please click here for the complete release by CMS Athletics.